Ho's Citadel Pub turns into a blazing red-hot box on December 9's night when a high-craze pack of ready-to-party-hard sweet divas invade the pub to express their rare nocturnal seduction and catch the best of the season's early fun. It's a total ladies night experience, one flared up with expletive cozy body languages in a grand style of wild revelry. Every diva is losing control. 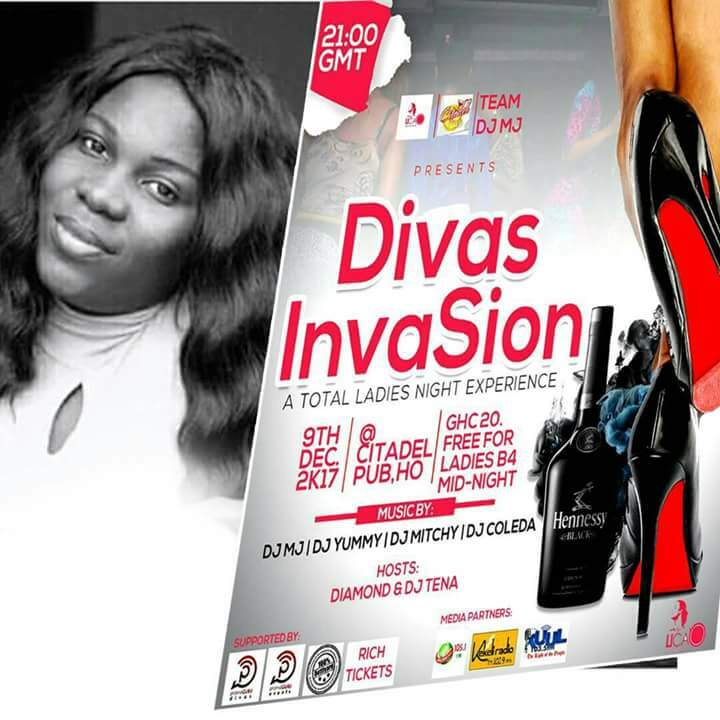 The night's crazy revelry dubbed "Divas Invasion" is coming off under the joint auspices of Team DJ MJ, Citadel Pub and LICA (Ladies In Creative Art). It's a crazy bevy affair and the news has crossed over the Volta stretch, thus Citadel Pub is foreseen fully packed with hot divas from remote areas outside Ho, not just lady students of the Ho Technical University. All sort of girls from Accra, Team and other addresses are coming in. The female DJs at the control are DJ MJ, DJ Coleda, DJ Mitchy and DJ Yummy .